How does Polar's new running watch stack up? 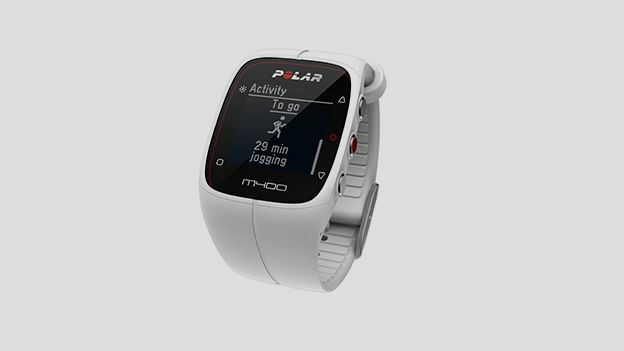 The Polar M400 is the companies' second activity tracking GPS watch, behind the much more costly V800 multisport watch. The M400 is mainly targeted at runners, although it does have a couple of other settings, cycling and 'outdoor other', as well as indoor. Like many of the fitness bands on the market, the Polar M400 tracks steps, distance, and sleep (along with calories), throughout your day using an accelerometer. However, it's also an excellent GPS running watch with it's idiot-proof performance breakdowns (smart coaching) and swift GPS lock plus a 'get me home' feature. Available with white and black straps, this has a practical, non-nonsense air and not one to bother Apple too much in the design stakes. No touchscreen, five labelled buttons favouring the right-handed and a monochrome dot-matrix style display could make the m400 feel budget, but it's saved by the quality of the components and the ergonomic softness of the strap. A nice touch is the buttons 'click' rather than bleep on activation, so that's one less thing you're forced to change immediately. Like many watches, it's possible to configure almost everything on the display via the PC interface. At 56.6g and 11.5mm thick it's far from the biggest GPS watch on the market, but it's not shy and retiring. You'll get around 8 hours in GPS-on mode, and roughly three weeks when you're just tracking daily activity. Polar have scored a particular goal by using a micro-USB port protected by a rubber cover, rather than some kind of cumbersome dock as some competitors have. This means when travelling you can use a phone charger or a laptop to boost the watch's battery without any fuss. Polar definitely got this one right, with full GPS lock on leaving a building taking on average less than a minute, often less than 30 seconds. The 'get me home' function provides you with a compass-style arrow and distance back to your start point, excellent for running foreign cities when travelling. The m400 has Polar's 'Smart Coaching' features built in like it's bigger brother, and has a great estimator option that'll tell you how long you'll take to complete a set distance, very handy for training and the big race day itself. We particularly liked the simple summary of your workout, going beyond the actual stats logged and delivering extra detail like the type of workout, and the exact benefits that type will deliver, such as better cardio fitness, fat burning, etc. At setup you enter your height, weight, age, gender and activity levels, which allows the Polar to give you a much more accurate picture of calorie use, rather than the generic estimate many apps deliver. Finally, the Polar M400 will track your PBs (personal bests) and alert you (via a little trophy cup icon) when you've broken new ground. The Polar M400 running watch isn't going to win any style prizes, but neither is it a disgrace to the wrist. We found taking advantage of the general tracking less useful because of this fact though, often swapping the Polar out for a less fitness focussed timepiece. However, as a running watch it's an excellent blend of decent battery life, easy setup and detailed training info. For those who want to customise their screens and workouts the options are there, but it's easy to get better fitness insights from this straight out of the box. For £159 it's streets ahead of the competition if you're looking for a watch to improve your running fitness and workout effectiveness.